Oooooooo. It’s that time of the year. Time for the holiday gift reviews! Caaaaan doooooo! As with prior years, I’ll be kicking things off with my one non-Christmas gift of the season, as sort of a prologue to the main items. My introduction to Rick and Morty was really just in the last year, and it wasn’t actually something from the show at all, but rather a gag animation done by the same crew featuring Rick and Morty reciting, verbatim, the record of an actual court case, which was somehow weirder than the actual show. It piqued my interest enough to give the show as a whole a try, and I’ve enjoyed what I’ve seen. In particular, I liked “Meeseeks and Destroy”, the episode that introduced the Meeseeks, a goofy disposable workforce. Today, I’ll be following the advise of Mr. Meeseeks’ catchphrase, and taking a look at him! Mr. Meeseeks is #174 in Funko’s Pop! Animation line, falling into their first assortment of Rick and Morty Pops. The figure stands about 4 inches tall and has a basic swivel joint at his neck as his only articulation. This Meeseeks appears to be based on Jerry’s first Meeseeks from the episode. Since it’s the one we spend the most time with, that’s pretty sensible. This guy merges the typical Pop aesthetic with the simplistic animation style of the show, though he leans a little bit more towards the show side of things. Really, the only thing that denotes this as a Pop is the larger, squarer shaping of the head. Everything else is pretty standard for Meeseeks. He’s got the round, blank eyes, but that’s really not a change for Meeseeks. He even ends up getting a mouth. Technically, Pops are supposed to omit that detail, but it’s probably one of the most overlooked rules, and I believe all of the Rick and Morty figures got mouths, so Meeseeks is far from the only figure in this category. 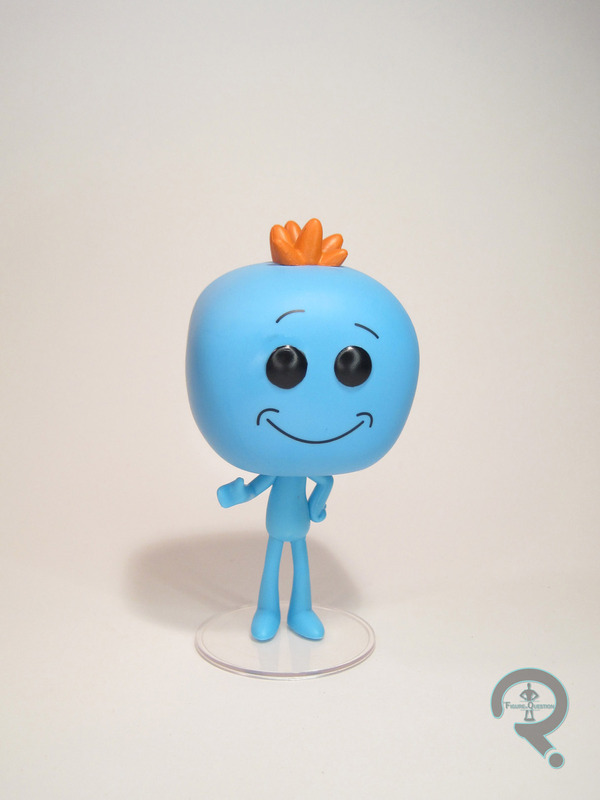 His pose is appropriate for Meeseeks, and certainly breaks from some of the more generic Pop poses, so I can definitely get behind it. Paint on Meeseeks is fairly sparse, with him mostly being molded in the appropriate shade of blue. There’s a little bit of paint for his face and hair, and that’s all fairly decent. Nothing amazing, but certainly passable work. 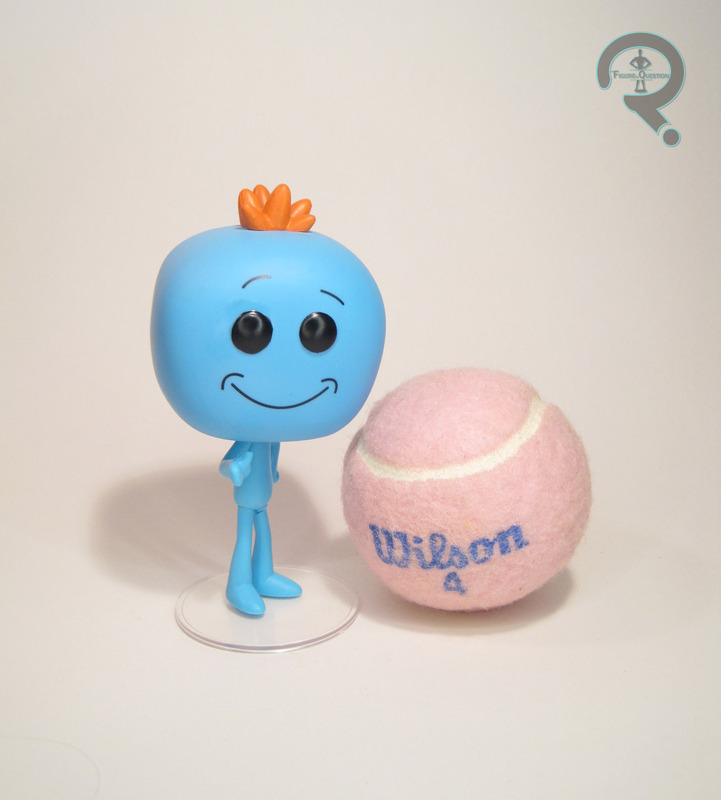 Meeseeks actually does include an accessory, which is outside the norm for a Pop. He gets a display stand to help keep him upright. I didn’t have too much trouble keeping him standing on his own, but I appreciate the option of the stand. Mr. Meeseeks was given to me as an anniversary gift by Super Awesome Girlfriend. She’s not really a fan of Rick and Morty herself, but she knows I like the Meeseeks, and she’s also a pretty huge fan of the “I’m Mr. Meeseeks” music video (which I definitely recommend giving a watch; it’s quite amusing), so she got me this guy. Pops aren’t always my thing, but this is definitely a case where the source material really fits the style well, resulting in a pretty solid final product.